At the beginning of November Ben left for the Army. I know, it is a shocker. Before he left we had a lot of fun celebrating Halloween and such. We went to a farm and got to go through some huge corn maze. The night before Halloween we went to our church's Trunk or Treat. Ben and I dressed up as Chicago Bears Super Fans. Actually, he was a Super Fan; I was just a fan. At the beginning of November Ben finally left for Basic Training. I say finally because it took three different tries before his recruiters submitted all of his paperwork completely. Don't get me wrong, I love my husband. But after saying goodbye several days in a row and getting up at four in the morning, I was ready for the emotional roller coaster to be over. Despite being numb with exhaustion when he finally left, it didn't take long for the feeling to seep back into me as I realized that he was really gone. Basic Training was tough. Ben always said that the hardest part was being away from me. Obviously, with the lack of push ups and training I had to do, the separation was the worst part for me too. I did not like not being allowed to talk to him. Writing letters turned out to be rather cathartic but it was hard to feel the connection between us. I eventually wrote him everyday, but by the time I got a letter from him he was responding to something that I had written over a week before. I suppose my impatience with the postal system only goes to show that I really am a product of the times. Despite my protests I have really been spoiled by the many recent technological advances. Luckily, Ben got a two week break for Exodus and came home for a visit around Christmas. It was a little weird seeing him at first. I was completely prepared for my husband to be unbearably ugly with his high and tight haircut, but, fortunately, my love goggles kicked in and I didn't notice (love goggles are similar to beer goggles but are activated with love instead of alcohol). I did however notice his weight loss. My dear husband (DH) is plenty skinny all on his own, but Basic sucked 10 pounds from him. 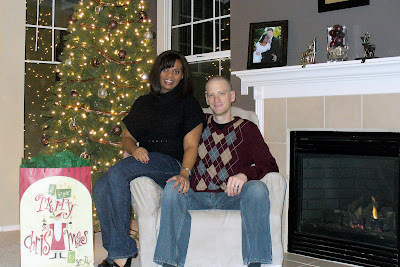 Many people thought he looked like an old sickly man in our Christmas picture (at bottom of post). Poor DH, I still think you look good. We had fun celebrating Christmas together and enjoying time together in our fully decorated and festive apartment. It was nice to relax with him the entire time. I had quit my job a little before DH came home, so I ended up only having to work two days while he was here. It was so amazing to spend so much time together. I realized during those days that I was truly happy. Unfortunately, I did not maintain that happiness for very long.